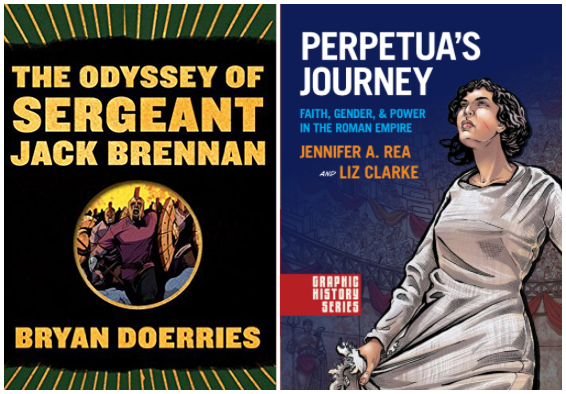 Ready to make the jump from prose to graphic novel? This continuous running, self-paced course teaches you how you can turn your written story into sequential art. Most people write words and put pictures to the words. Words, picture, words picture. The picture is merely what the words are saying and It results in boring, sad, unimaginative, undramatic comics. It doesn't lift off the page. This is the story you've been working on for years, or have dreamed about or lived! 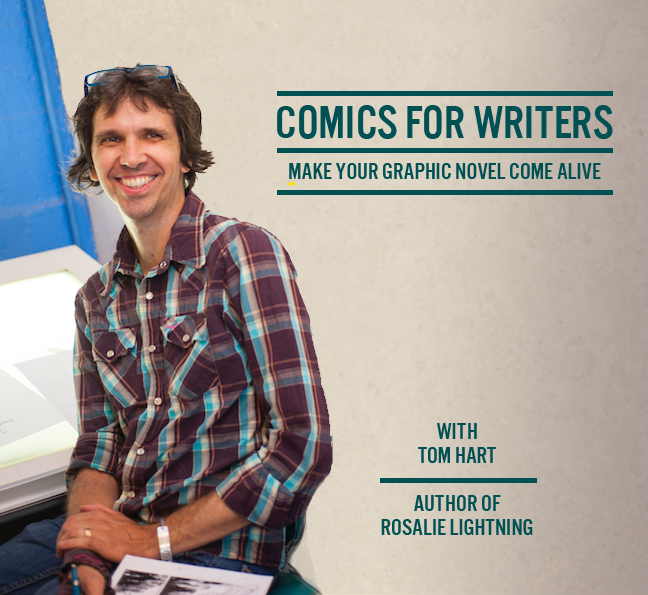 Yes, you can learn to make your graphic novel soar! or a whole story or project, already mapped out, maybe even written. I've seen potential students at this point lose their way, feeling more lost and alone in their quest to find the vision in their story. They settle for pictures of what the words already say. They settle for boring their readers. They settle for just putting pictures what they've written inside little boxes. I won't let that happen to you! 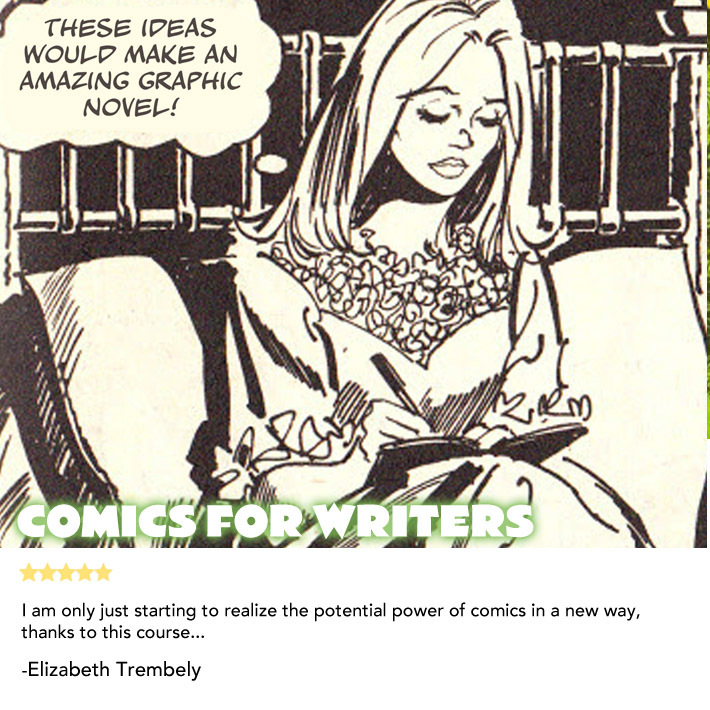 Comics For Writers is a complete curriculum designed for scholars, historians, memoirists, journalists, storytellers and writers of all kinds looking to expand into graphic novels or short-form comics. Start any time and proceed at whatever speed works for you. Receive feedback on your work from Tom as you go. I'm Tom Hart, a New York Times #1 Bestselling graphic novelist who has been creating comics tirelessly since about 1993. Despite my decades of drawing, it took me years to figure out that I'm a writer first, and now that I have, I have made it my passion to help people tell their stories. Some of my favorite graphic novels and memoirs succeed on the power of their writing, with the images serving the ideas and story. Alison Bechdel’s Fun Home and Are You My Mother? And Art Spiegelman’s Maus come to mind. When I needed to make my most important book, my book about my fabulous daughter, I knew I didn't have the visual skills to make you believe it was happening in front of you, and that's not what the book was about. It was an internal book. To work, it needed to rely on honesty, concepts, and language. My memoir, Rosalie Lightning, relies on the power of the thought and emotion behind it, not on the skill of the drawings. Every work I create starts with copious notes, and pages and pages of free-writing. From there I try to find the magic combinations of words and pictures to let the ideas soar. I know where writers like you are coming from—and I know how to make the jump from prose to image. Comics For Writers collects what I’ve taught for 16 years and tailors it for people like you, who are used to words and ideas, but just starting to work with images, visual narrative and design. 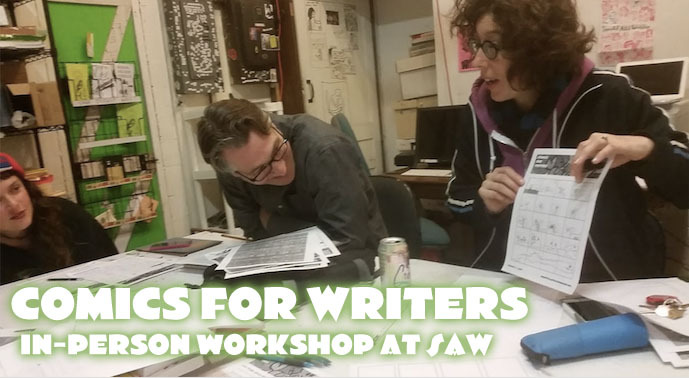 When you join Comics for Writers, you'll have immediate access to hours of seasoned instruction, inspiration, presentations and exercises to get you understanding how comics can be magic and to make that magic yourself. 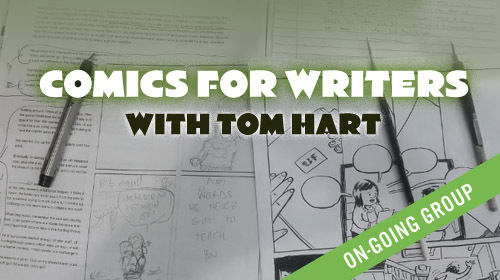 You'll use what you're good at—writing—to create good, well-written comics. And you’ll share what you’ve created via a SAW Online Google+ Group. You’ll find your way—and your voice. Click Here to download my Free booklet, You Can't Do This in the Movies! This course will set you on your way to understanding the medium but also finding your voice in it. BONUS: Stan Lee on the "Marvel Method"
Section 8 - You Can't Do This in the Movies! This course is self-guided but includes access to a Google+ group of people working on this course. There have been lots of great work posted already! Tom Hart is very active on Google+ and responds thoroughly to all Comics For Writers posts. Additionally, Tom Hart posts frequent updates, challenges, ideas and exercises. I'm already an artist, is this course for me? The course is for anyone who wants/needs to understand how comics works , and how words and images work together. In other words, it doesn't teach writing- like story, character, plot, and it doesn't teach drawing- like anatomy, composition, style, it teaches how to think about the words and the pictures so they serve the story you've brought or been given. 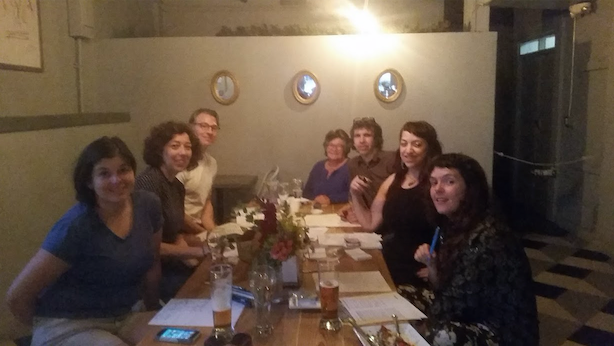 You will have adapted in rough form, a single page of prose twice (from my friend Jenny Offill) and one of your own pieces of work into script, then panels and then a page. Additionally, we will have completed at least four other substantial exercises. You'll be amazed at how much you learned! Is this similar to classes you run at SAW? I ran this in person at SAW in Feb-March 2017 and it went awesomely. Here we are at culmination celebration! The Art of Telling Your Personal Story in Comics. This self-guided course of videos and exercises will help you on your way.